Mustang Grape Jelly is definitely a Texas Jelly. While there are a total of 14 wild types of grape in Texas, the jelly I have made is from Mustang Grapes, which is the most common grape in the eastern half of the state, including the Hill Country. It ranges from southwestern Texas up to Oklahoma and even into Louisiana and Arkansas. The fruits are sour, dark purple grapes, and the largest in Texas. 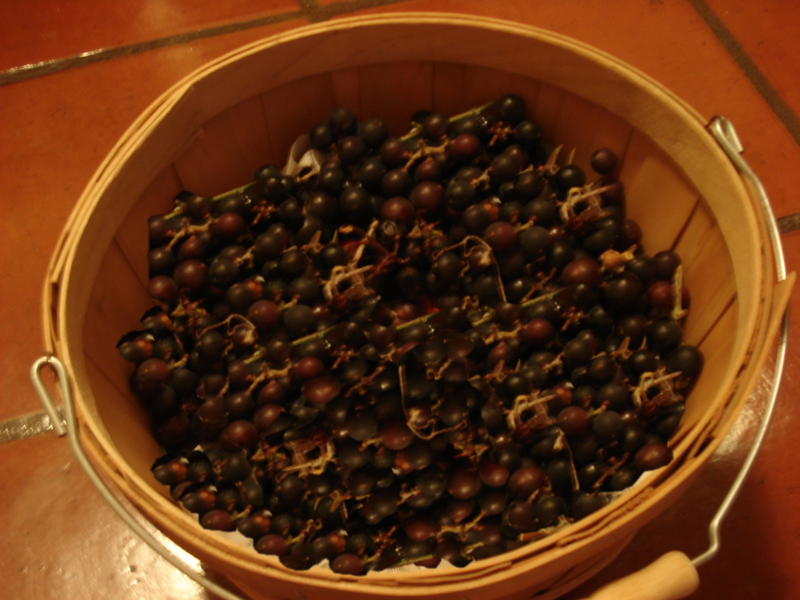 The Mustang Grapes are ripening now and will continue to be ripe for several weeks yet. Now is a good time to check out your favorite site. As mentioned in an earlier post, grape vines are quickly spotted even while zipping down the freeway in your car so you can easily find all the vines you need. Some plants will be male so you will need to find the ones with the fruit. Bring a scissors or clippers with you to cut the clusters of grapes off the vine. Wear gloves so you don’t irritate your skin while picking the fruit. Grape jelly can be made with any variety of grape so even if you find another variety of grape the jelly will turn out great. Because the fruit is so sour it makes a very refreshing jelly, since it retains enough of the tartness to remind you it came After separating the fruit from the stems and washing them, you are ready to begin. You will need approximately 10 cups of fruit. Crush the fruit with a potato masher, a food processor, or a blender. Heat the fruit on the stove until you have juice. Pour the mix into a food mill to extract more juice. Then pour through a cheese cloth or jelly bag. Then add the sugar. After a minute’s hard boil add the pectin. Cool and then pour into freezer containers. After assuring that the jelly has set, freeze the jelly. I use large containers so that they are easier to stack in the freezer. My Mustang Grape Jam was made due to the amount of cooked pulp left over from making jelly. The pulp had already gone through the food mill and then had been left behind in the cheese cloth. I then added sugar and pectin. Obviously one could make this without making jelly first. Recently I was cleaning out my freezer when I noticed white grape juice I had made with the help of my juicer. My first thought was that it would make too sweet of jelly and not a very pretty color. After some deliberation I mixed 3 cups of White Grape juice with 1 cup of boiled Mustang Grape Juice. It was perfect. The Mustang Grape Juice gave it a pretty red color and a tart flavor while the White Grape Juice gave it a nice smooth flavor. 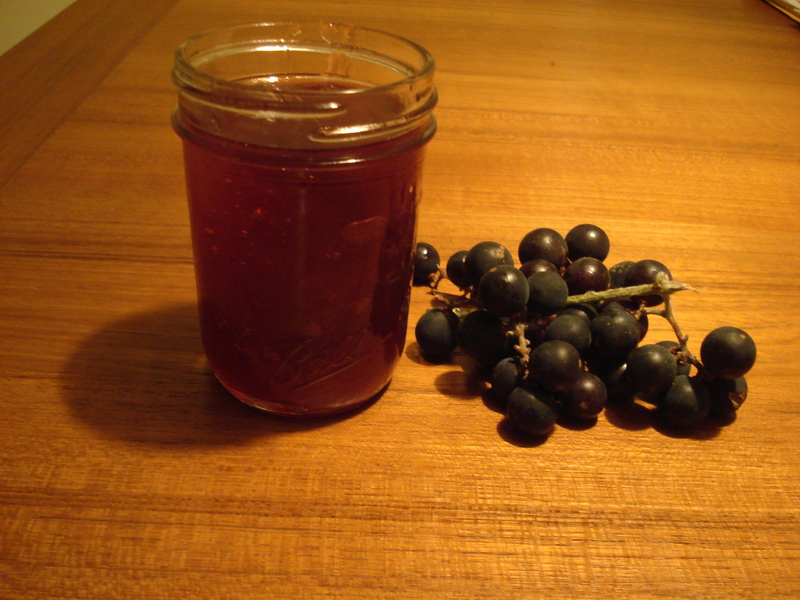 Follow the recipe for the above Mustang Grape Jelly. While thawing out the White and Mustang Grape Juice I decided to thaw out a stray container of Mulberry Juice. 2 cups White Grapes, 1 cup Mustang Grape Juice, and 1 cup of Mulberry Juice made in the juicer. The Mulberry Juice changed the color of the jelly to a much darker red. I love pretty colors in my jellies and jams. By the way, if you would rather just have the juice, these above proportions are perfect for drinking the juice if you’d rather not use it for jelly. I did find that one can add water to the mustang grape juice to dilute the acid in the juice. Gallery | This entry was posted in Recipes and tagged Delicious Jelly, grape jam, grape jelly, grape pulp, grapes, Mixing Grape varieties for jelly, Mixing with Mulberry Juice, mulberry jelly, Mustang Grape Jelly, Tart Jelly, Vine fruit, White Grape Jelly, White Grapes and Mustang Grape Jelly, Wild Grape Jelly, Wild Mustang Grape Jelly. Bookmark the permalink. Try Agarita and Mesquite Jellies…maybe a new Retama Jelly??? Agarita is one of my favorite jellies. Mesquite made a light yellow color jelly. As far as Retama I am not familiar with making a jelly out of it. I have read that a tea can be made from the ground beans. I have followed recipes for Mesquite bean jelly that made a straw color, but I tried cooking them much longer, like almost 8 hrs, and came up with a darker honey colored base which is vastly better in flavor, almost like a dark honey!!! Sounds delicious and pretty. I wonder if you cooked them in a crockpot or two if that would reduce the effort? I agree that mesquite jelly is a mild taste otherwise. Crock pot sounds like a great idea, although I just simmered them with a lid on and added water when needed, so it was not a great effort. Sorry to hear about the seeds in the raisins!!! Yes, Ray, unlike cultivated grapes, wild grapes have male flowers on one vine and female flowers on another. Thus the male grape vines will produce flowers but no fruit. If you have more than one male vine in the area you could eliminate the surplus males. I once bought a jar of green (unripe) Mustang grape jelly at a little country cafe, but have never seen a recipe for it – not sure when to pick them or if they need more sugar. I think I remember my mother telling me that you had to pick the green grapes when they were tiny before a seed formed, or something like that. Does anyone know anything about cooking the unripe Mustang grapes? Mom also made a green grape cobbler a couple of times – delicious, so tart! Right now (May 24), the grapes are pretty big and hard, so don’t know if I could make anything with them now or not. I sure would appreciate some information on green grapes. Thanks. Thank you for visiting my site. Sorry I took so long getting back to you. I have not made green mustang grape jelly but the recipes I found indicated that the seeds need to be green and the grapes will be small. However, since jelly making removes the seeds I don’t understand why that is necessary for the jelly. I can see why the grape seeds would need to be green if you were putting them in a pie. I do know that some mustang grape jelly recipes call for including some half ripe mustang grapes to provide pectin so that you would not need to add pectin. Be sure to wear gloves when picking mustang grapes. Here is a recipe for green mustang grape pie. Pick grapes while seeds are still soft. Simmer until the skins are tender. Pour into pie shell and bake at 350 deg. until crust is light brown. Melt butter or margarine in baking dish. In a seperate bowl, mix the rest of the ingredients. Pour batter into the baking dish. DO NOT STIR !! Pour filling into the batter. Again, DO NOT STIR! Bake at 375 deg. until batter rises and browns on top. One of my Mom’s favorite pies was green grape (Mustang). I remember that you had to add lots of sugar for it to be palatable. I believe you are right about the size before the seed forms, but I am afraid I have forgotten the details. I will ask some relatives. Thanks for stopping by. If the seeds were hard you would be biting into them. Also definitely not one of the low sugar desserts. Even when ripe I don’t think it would be a low sugar dessert. I prefer eating seedless grapes so having to take seeds out of a pie just doesn’t sound like my cup of tea. We were in southern Spain and children sold us raisins. I didn’t even think about it until I bit into the seeds. I didn’t know there were seeded raisins. Go figure. Didn’t eat many of those rasins. Can the mustang jelly freezer recipe be used for the water bath jars of jelly and NOT put in the freezer? Barbara-Yes. It could be used for water bath jars. I choose to put it in my freezer but it should work fine in the water bath jars. It can be slightly runnier either as a freezer jelly or in jars than the standard recipe. The mustang grapes in Texas are at their peak right now. It hurts me to see all the unpicked fruit. We were in Austin recently and I couldn’t believe all the unpicked mustang grapes everywhere I looked. I am trying to use up all the jellies in my freezer so I’m not picking much fruit this season but it was tempting. I even took a friend out to pick mustang grapes but I didn’t keep any for myself. We picked about 8 gallons of fruit. How much water do you add to your fruit when you being cooking it. we have been adding enough to cover the it, but are wondering if we are adding too much water. Thank you for visiting the site. I just crush the fruit before putting it on the stove and let the natural juice flow out of the grapes as they cook.It should give you a tastier jelly since it won’t be diluted. Your information is very helpful to a novice jelly maker. One quick question …. what do you do about the stems on the grapes? Is it necessary to remove them totally or will they be removed in the cheesecloth step? Thanks. You could leave the stems on since you will be using the cheesecloth. Having said that I remove all stems, leaves etc. since I want neither the taste nor the color of bark, stems or leaves in the jelly. I just juiced up 35 pounds of grapes last night. I removed all the stems so that I will have a clearer jelly. Hope that clarifies things a bit. A couple of notes: I would go ahead and clean the grapes of stems as well as you can before cooking them and straining the juice. Once simmered (you don’t need water but use a medium low setting) I put mine in a strainer with medium mesh over a big bowl and I DO Not push out the excess juice, but let it drip until it quits dripping. Then refrigerate it in a glass container overnight and strain it again through damp cheese cloth. Again, I don’t push any juice through, just let it be. The reason is that the tannin in the stems, skin, and seeds and acid in the juice can cause crystals to form in the jelly. Once I’ve strained the second time, I go ahead and make jelly. I use Pamona’s Universal Pectin which is a natural pectin that requires very little sugar, and you can use other sweeteners, like Agave, honey, stevia, coconut sugar, even maple syrup. My friends all have sugar on their No-No list these days so I try to reduce the amount and use natural sweeteners. The advantage is when you have perfectly ripe fruit at the height of their flavor, the Pamona’s allows the natural fruit flavor to shine. One disadvantage is that the sugar acts as the “preservative” so my low sugar jams/jellies don’t have as long a shelf life. I am using smaller (12, 8, or 4 oz.) jars so it gets used up more quickly. Now, about Green Mustang Grape Pie. I’m looking for my auntie’s old recipe but you definitely need to pick the grapes when they are very small and the seeds haven’t developed. Yes, it takes a lot of sugar. You can also use the little greenies to make a whole fruit preserve. It’s been a lifetime since I did this so I’m going to have to consult with my cousins down in Palacios about the Pie. They have lots of Mustang grapes down there. And chiggers. And mosquitos. Very big mosquitoes…. I remember the days when people used to use wax to seal jars (no lid) and if a little bit of mold developed on top, just scape it off. Then I had a Home and Health Science teacher come to our Master Gardners group to teach the “science” of home canning. She showed slides of dendrites or “root” like structures growing from that little visible bit of mold on top of the jelly all the way down to the bottom. No, none of us died from the old practices in my family (that I know of), but I’ve never been able to just scrape off the mold and eat the jelly or jam ever since. Thanks, Dr. Parsons for a great website! I have a Blanco Crab Apple I planted about 5-6 years ago after moving to Boerne and I’m hoping to have enough crab apples this year after all this rain to make more than one little 4 oz. jar of jelly! Last year I donated it (the jelly) for auction at our Native Plant Society Boerne Chapter meeting and they were fightin’ over it! I noticed that now where does it say it is a good idea to put your juice in a big glass jar, and let it sit in the fridge for 48 (or more) hours. I have been doing this with my processed juice for years. The sediment drops to the bottom, then I strain it clear two more times. There is A LOT of sediment that gets strained out. The resulting juice is clear and a very deep purple-red and makes a delicious jelly. Robyn- You have a great method for getting extra clear juice. Note that I extract the seeds and larger pulp with a food mill. Then the juice containing the rest of the pulp is poured through several layers of cheese cloth. The pulp I extract in the cheese cloth is what I use to make the jam.